film to be voiced by his original actor) and the first performance of Wayne Allwine as Mickey Mouse. Mickey's Christmas Carol will be nominated for an Academy Award for Best Animated Short Subject. Avenue and Flower Street in Los Angeles is expected to be completed by December 2006.
brother Jacob were the first to write down such classic tales as Snow White, Cinderella, and Sleeping Beauty. Bambi, is born in Charleroi, Pennsylvania. Realty and Investment Company; and the Disney Film Recording Company. The Walt Disney directed Silly Symphony cartoon The Merry Dwarfs is released. live-action feature The Happiest Millionaire as Rosemary. California. No announcements of the funeral are made until after it has taken place. town of Bethlehem on the eve of the first Christmas, it is based on the children's book by Charles Tazewell. Disney Channel Christmas airs on the Disney Channel. The Commisary restaurant opens at Disney-MGM Studios. Adventures reopens as Snow White's Scary Adventures. Encounter offers a soft opening. home in West Los Angeles, after suffering a stroke the day before. free refreshments, candy canes, and "Engineer Santa." Disney's 2003 comedy hit Freaky Friday is released on DVD and VHS. Actor Edward James Olmos narrates Epcot's Candlelight Processional. direct Tim Allen as a man who occasionally changes into a sheepdog. BFCA Awards (given by the Broadcast Film Critics Association). for his or her contribution to the area's tourism industry through community service. the park with personal guides, armed with Fast Passes to the most popular rides and attractions. Lady St. Edmund resides, with three orphans and her butler Priory, is the resting place for a hoard of treasure! Disney's animated Peter Pan is released in Italy. an official SAC Contact on January 12, 1955. Christmas short, Chip 'n' Dale fight with Donald for the goodies under his tree! he held the title of director emeritus and consultant for the Company. Roy E. Disney, Mysteries of the Deep is one of thirteen True-Life Adventures. this morning. He was 65 years old. a ski resort in Sequoia National Forest and the renovation of the 10-year-old Disneyland at Anaheim. company and was deeply involved in all its operations. Indeed, with the recent decision of Jack L.
veteran moviemakers who remained in personal control of a major studio. the plans for the future that Walt had begun will continue to move ahead." 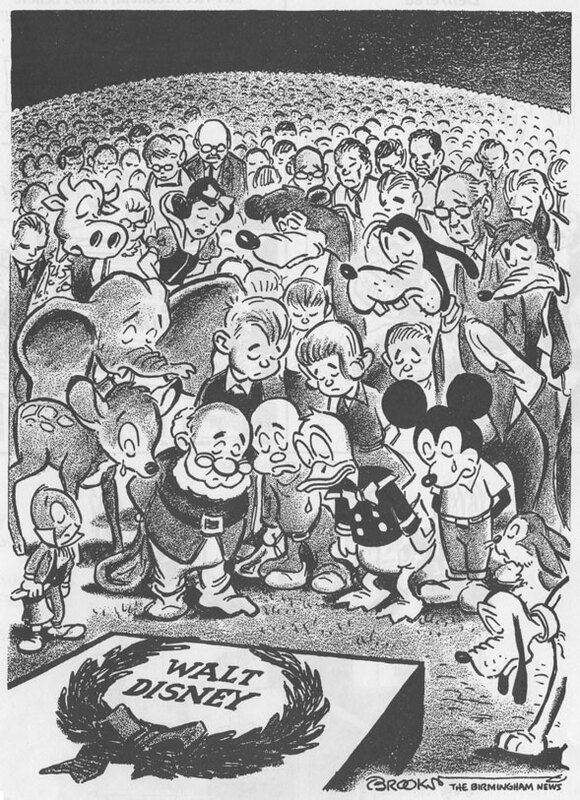 Disney was its master showman. Company in the way that he has established and guided it." The Little Mermaid (1989) all the way through to Home on The Range (2004). "Well, WED is, you might call it my backyard laboratory, my workshop away from work. with it… so I had to go ahead on my own and develop it to a point where they could begin to comprehend what I had on my mind." Empire's ultimate weapon of destruction. Winners will be announced January 16, 2014. Groove, Monsters, Inc.(2001), Kronk's New Groove (2005), and The Emperor's New School (2007-2008).